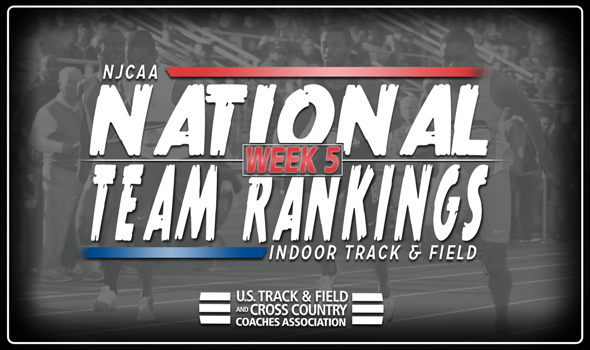 NEW ORLEANS – After a brief stay in second in the NJCAA Men’s National Team Rankings, Barton (Kan.) CC is back in the top spot of the newest batch of rankings, announced the U.S. Track & Field and Cross Country Coaches Association (USTFCCCA) on Wednesday. The Cougars were solid at the Region VI Indoor Championships, putting together just enough to vault back into first in the rankings to join the Iowa Central CC women atop the rankings. South Plains (Texas) also made a move towards the top in the men’s rankings, jumping to second, while the New Mexico JC women moved up to second as well. Barton (Kan.) CC posted four top-10 NJCAA Descending Order List marks at the Region VI Indoor Championships, led by Travis Hugg’s long jump mark of 7.27m (23-10¼) that ties him for fifth in the NJCAA this season. South Plains (Texas) used the Texas Tech Matador Qualifier to boost its rankings, as the team notched three top-10 NJCAA Descending Order List marks. The Texans’ Danylo Molchanov recorded a 15.16m (49-9) leap in the triple jump, good for second in the NJCAA. Iowa Central CC fell two spots to third after dethroning Barton County (Kan.) CC for the top spot in the rankings a week ago. Cloud County (Kan.) CC and Coffeyville (Kan.) CC rounded out the top-five in fourth and fifth, respectively. Cloud Country (Kan.) CC has held down the fourth spot in the rankings for three-straight weeks now, while the Ravens of Coffeyville (Kan.) CC are fifth for the second-consecutive week. The women’s NJCAA rankings didn’t see as much of an overhaul as the men’s side did. Iowa Central CC continued to hold down the top spot as it has done all year long. The Tritons hit five top-10 NJCAA Descending Order List marks on the weekend at the Region XI Indoor Championships. Michelle Tomlin (weight throw), Payton Roberts (shot put) and Adva Cohen (1000 meters) are all ranked second on the NJCAA Descending Order List in their respective events after this past weekend. The Thunderbirds of New Mexico JC absolutely dominated the Descending Order List this past weekend to give itself a boost into second place. A total of 12 top-10 Descending Order List marks were hit at the Texas Tech Matador Qualifier and the Region V Multis. Esther Gitahi hit the top spot in the 1000 with a time of 2:51.05. New Mexico JC’s rise caused Central Arizona to slip one spot to third. South Plains (Texas) and Barton (Kan.) CC held their ground in fourth and fifth, respectively.